The 2012 Spring Championship of Online Poker (SCOOP) at PokerStars resumed on Monday with Day 2 and it was a busy day, indeed. Several notables made big splashes, but Viktor "Isildur1" Blom is the talk of the town. Cash-game wizardry aside, Blom is starting to make a name for himself in the tournament side of the game. He did it at the PCA and got the job done in the SCOOP, as well. Joining Blom in the winners circle on Day 2 were Alex "Allingomes" Gomes, Rodrigo "caprioli" Caprioli, and Kami "drkamikaze1" Chisholm. With 15 players remaining, Alex "Allingomes" Gomes won a crucial race that got his Day 2 run started. He four-bet shoved for 32 big blinds out of the big blind and after Joao "Naza114" Vieira folded his opening raise, three-bettor Joseph "subiime" Cheong called with . Gomes tabled and took a commanding lead on the flop as it fell . No miracle came for Cheong who busted on the following hand. Short-stacked "yasunori66" fell after shoving under the gun for 139,800 at the 10,000/20,000/2,500 level. Artur "arturitooo" Alabart called from the big blind with , slightly behind the of "yasunori66." The board ran out making a straight for both players, but giving Alabart the better end to eliminate "yasunori66" in sixth place. The following hand resulted in "dirty.brasil" losing almost all his chips. From the cutoff, "dirty.brasil" min-raised to 40,000 and was only called by "raidalot" on the button. The flop came down , leading to a bet of 48,660 from "dirty.brasil." A raise to 120,000 is what came next from "raidalot," but that was met with a re-raise to 199,996. Putting an end to the near click-backs, "raidalot" shoved for 675,282. A few moments later "dirty.brasil" called with , but that trailed the of "raidalot." The turn and river were no help to "dirty.brasil," who was down to less than four big blinds and busted two hands later to finish in fifth place. The next to exit was "Str8$$$Homey." At 12,500/25,000/3,125, "Str8$$$Homey" opened in the cutoff with a min-raise to 50,000. Next to act was Alex Gomes and he three-bet to 112,780. The blinds folded, "Str8$$$Homey" four-bet to 260,000, and Gomes called to see a flop hit the table. "Str8$$$Homey" bet about 40 percent of the pot with 225,000. A call from Gomes delivered the turn where "Str8$$$Homey" fired again, this time for 350,000. Another call from Gomes landed the river. "Str8$$$Homey" jammed for 1,111,312 with , but Gomes couldn't call fast enough with , the nuts, to bust "Str8$$$Homey" in fourth place. The two agreed to look at the numbers for a potential deal but were unable to come to terms. The ensuing heads-up duel took 130 hands, but Gomes maintained his lead throughout and emerged victorious. On the final hand, with the blinds and antes at the 17,500/35,000/4,375 level, Gomes min-raised to 70,000 on the button. Alabart reraised all in for 882,634 and was met with a quick call from Gomes with . Alabart tabled a dominated and was unable to catch up as the board came down to finish runner-up. For his win, Alex "Allingomes" Gomes earned a cool $282,400. PokerStars Team Online's Mickey "mement_mori" Petersen made a deep run in Event 1-M, but came up just short of the final table with a 10th-place finish. As for the final table itself, following the elimination of March Sunday Million winner "SpeckBasu" in fifth place, a four-handed deal was worked out. "Heminsley" outlasted the field and earned $123,868 for the victory. The first "low" event of the SCOOP wrapped up Monday and if earning $74,008 for a win is considered low, well then sign us up. "Blackbeaty" topped the 25,520-player field to pocked the first-place payday. Day 2 of the $2,000 No-Limit Hold'em tourney — the "High" version of Event 2 — saw 50 players return to do battle. Among those cashing during the afternoon and early evening were Dan "djk123" Kelly (39th - $7,184.40), Paul "pvas2" Vas Nunes (36th - $8,114.40), Kevin "scarface2911" Howe (34th - $8,114.40), Elio "smokrokflock" Fox (28th - $8,114.40), Larry "BBOY3110" Sharp (27th - $9,273.60), Rafael "LiroLa" Monteiro (23rd - $9,273.60), Adrià "Chojjasd" Balaguer (20th - $9,273.60), Evan "SenorPokes" Jarvis (14th - $17,001.60), and Kyle "kwil20" Wilson (13th - $17,001.60). After five and half hours of play on Day 2 they reached a break with just 10 players left, at which point "pokerpro_kk1" held a commanding lead with more than 1.92 million, with Sam "SamSquid" Grafton, "pyszalek," and Toby "810ofclubs" Lewis in the next three spots, all just over 1 million. And in fifth was Luke "LukeFromB13" Staudenmaier , who earlier on Monday took 28th in Event 1-H.
With the blinds just 10,000/20,000 to start the final table, all were deep enough to show patience, and indeed it would take about an hour and a half before the first elimination. With the blinds up to 15,000/30,000, Sam "SamSquid" Grafton opened for 63,000 from early position. Then "pokerpro_kk1" jammed for 122,984 from the button and it folded back to Grafton who called. "pokerpro_kk1" had the advantage with against "SamSquid's" , but the board came to pair Grafton and send "pokerpro_kk1" out in ninth. Shortly, it was Cassio "cassiopak" Kiles four-bet shoving with and getting a caller in Grafton with . An ace flopped and when Kiles couldn't catch up he hit the rail in eighth. Toby "810ofclubs" Lewis soon followed in seventh after open-shoving from UTG with , getting called by Luke "LukeFromB13" Staudenmaier with , and watching the board come . About a half-hour later “@cey@lone” opened with a min-raise to 80,000 from middle position, then “pyszalek” jammed for 678,306 from the small blind, getting a call from “@cey@lone.” “pyszalek” had and needed to catch against “@cey@lone's” , but the board came and “pyszalek” was out in sixth. The remaining five pushed on for a while, then stopped to discuss a deal, at which time Sam Grafton enjoyed a sizable advantage. The group soon agreed to terms, and play resumed with $20,000 still on the table for which to play. Nearly an hour later Grafton had increased his lead, having pushed up over 5.2 million when “7Be/\eC7” open-shoved for 952,029 with and Grafton was his only caller with . The flop brought a seven and by the turn “7Be/\eC7” was drawing dead. Luke "LukeFromB13" Staudenmaier became short-stacked shortly thereafter and pushed from the small blind with only to run into “@cey@lone”'s in the big blind. The board came , and Staudenmeier was out in fourth. With three left a huge chip swing occurred when "greezhool" got all his chips in on the turn against Sam Grafton with the board showing . Grafton had for two pair, but "greezhool" had for the better two pair, and after the river all three remaining players were nearly even in chips. Then, just three hands later, Grafton and "@cey@lone" got into a preflop raising war that ended with Grafton all in with "@cey@lone" only barely covering. Grafton had and "@cey@lone" , and when the board ran out nine-high Grafton was out in third. “@cey@lone” enjoyed a big advantage to start heads-up play with more than 6.93 million to “greezhool's” 2.72 million. The pair battled for more than half an hour, over which time "greezhool" caught "@cey@lone," then pushed out to about a 2-to-1 chip advantage. Then came a hand in which "@cey@lone" opened with a 2x raise to 160,000 and "greezhool" called. The flop came , and after a check from "greezhool" they bet back and forth until "@cey@lone" was all in with against "greezhool"'s . The turn was the and "@cey@lone"'s trips were still good, but the river brought the , giving "greezhool" the pot and the title. 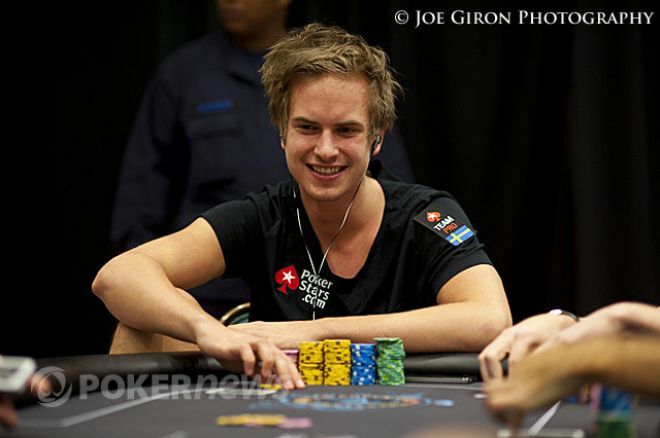 Viktor "Isildur1" Blom began the day 16th in chips of the remaining 89 players entering Day 2 of Event 2-M. He began by staying out of the way before vaulting toward the top of the counts with 30 players remaining. He stayed at or near the top while play reached the final table where he began as the chip leader. In a battle of the blinds, "lubor74" became the first player eliminated from the final table. A raising war with "szwindel" culminated with "lubor74" calling all in for about 30 big blinds with . "Szwindel" turned over and took hold of the chip lead when the board rolled out . "Gusparo" departed a few minutes later after coming out on the losing end of a coin flip. Holding , "Gusparo" failed to hold up against the of "cloaknet" when an ace hit the flop and the river. Down to less than an ante, "Gusparo" busted the next hand. Over the course of the next half hour, Blom (who had lost the chip lead) regained the lead before extending it by eliminating "cloaknet" in seventh place. Action folded to "cloaknet" in the cutoff who put in a min-raise. Blom three-bet from the small blind, only to see "cloaknet" put in a four-bet. Blom put an end to the reraising and shoved with the bigger stack, leading an all-in call from "cloaknet" for another 14 big blinds. The for "cloaknet" didn't catch up against Blom's , leaving six players remaining. Blom wasted little time gathering more chips, eliminating "rzr900rzr" a few hands later. A min-raise preflop from Blom was called by "rzr900rzr" in the small blind, delivering an flop. An overbet shove came from "rzr900rzr" with and Blom was quick to call with . The draw didn't get there for "rzr900rzr," out in sixth place. The fifth-place finisher wound up being "vikAAAA." All in for ten big blinds with , "vikAAAA" couldn't improve against the of "szwindel." Things appeared to get easier for Blom following his eliminating Frederik "Fred_Brink" Jensen, the other big name at the final table, in fourth place. A series of raises culminated with Blom five-bet shoving into Jensen's . Blom was trailing, but that didn't last long as the flop rolled out to give Blom a commanding lead with trips. The turn card gave Jensen outs to Broadway, but the river locked up the pot for Blom, giving him more than half the chips in play. Heading to the exit in third place was "szwindel." Following an flop, "szwindel's" move with was called by Blom who had . The turn and river secured the pot for Blom, who was up about 4:1 in chips going into heads-up play. Five hands was all it took for Blom to lock up the victory. "RaisingRay91", on the button, opened with a raise and upon seeing Blom three-bet from the big blind, "RaisingRay91" four-bet shoved for 30 big blinds with . Blom called with and was safe through the flop. The turn took away outs from "RaisingRay91" and the river officially ended the tournament. Just 70 players survived the first day of play in this one, and it didn't take long — just over four hours — for a winner to emerge from that remaining field. Jonathan "JonnyDS" DSouza (68th - $736.33) was among the first out on Monday, while Alex "J0hnny_Dr@m@" Zervos (17th - $1,443.80), Bruno "bubbleboybr" Serverino (12th - $2,634.93), and Rory "Mafews" Mathews (11th - $2,634.93) all came up just shy of the final table. The end saw a nearly even four-way chop, with “Soco2I” of the Czech Republic ultimately taking it down. Plenty of other big names remain, too. Among them are Steve "Illini213" Barshak (14th), Mike "munchenHB" Telker (17th), Owen "ocrowe" Crowe (31st), Dani "supernova9" Stern (33rd), George "Jorj95" Lind (34th), Ana Marquez (35th), and Calvin "cal42688" Anderson (39th). The medium version of this two-day event saw a number of familiar names among the leaders at the end of play. Only 57 players made it through with Hugh "Jackovich" Cohen (20th), Bertrand "ElkY" Grospellier (24th), Ana Marquez (53rd), and Casey "bigdogpckt5s" Jarzabek (54th) among those chasing the leaders. Another guarantee was crushed in this rebuy event, with just 93 players out of the 20K-plus starting field making it through the first day of play. Among that group are Danny "THE__D__RY" Ryan in 52nd and Alex "J0hnny_Dr@m@" Zervos in 53rd, nearly even with below-average stacks of just over 1.85 million. With eight players making the final table and only seven cashing, Bryn "BrynKenney" Kenney and Shaun "shaundeeb" Deeb traded turns as the short stack before Kenney busted just shy of the money. He raised in the hijack and was met with a call from Noah "Exclusive" Boeken in the big blind. Boeken drew two to Kenney's one, but proceeded to check-raise following Kenney's bet. Kenney put in a three-bet, though, slowing Boeken down who just called. Each drew one this time around and Boeken bet, leading to an all-in call from Kenney. Both drew one again on their final draw and Boeken revealed for a solid three-card badugi. Kenney had a good three-card badugi, as well, but was just behind with to finish one spot out of the money. Deeb lasted four more hands before hitting the rail. He opened under the gun and Boeken three-bet from the hijack. Deeb put in a four-bet, Boeken called, and Deeb stood pat. Boeken drew two and proceeded to call Deeb's all in. Deeb stood pat on both his remaining draws while Boeken drew one then stood pat. Boeken revealed , having got there against Deeb's . Taras "Peshka1502" Sotnikov was the next to go, getting his short stack into the middle before the draws against Paul "paulgees81" Volpe. Sotnikov stood pat all the way, while Volpe drew one the entire way before revealing . It just bested the of Sotnikov to send the Spaniard to the rail in sixth place. However, Volpe was the next to depart. He and Boeken were both dealt great hands and stood pat the entire way. With , Boeken just edged out the of Volpe. Boeken would go no further, though, and finished in fourth place. A three-handed pot was heads-up by the time the second draws were made. Rodrigo "caprioli" Caprioli stood pat on his remaining two draws while Boeken drew one and then stood pat. Caprioli tabled , defeating the of Boeken. Nearly two hours would pass before the next elimination. "Zimmy86" departed in third place, falling to overwhelming chip leader Rodrigo Caprioli. The hand started with "Zimmy86" raising from the small blind and Caprioli defending his big blind. Each drew two to start with "Zimmy86" putting out a continuation bet. Caprioli popped it, "Zimmy86" called, and each proceeded to draw one. Down to less than a big bet, "Zimmy86" bet all in. A call from Caprioli led to each drawing one again. Neither made a four-card badugi, but Caprioli's bested the of "Zimmy86." Gray lasted 24 hands before bowing out in second place. On the final hand, Gray was all in before the draws on the button. Caprioli called and proceeded to draw two, one, and one. Gray went one, two, and two, only able to muster a three-card king with . Caprioli tabled for a better three-card badugi to claim the victory. Highlighting the final table of the medium buy-in Badugi affair was PokerStars Team Pro Chad Brown. One of the best all-around players in the game, Brown ended up finishing in sixth place. Germany's "Foofighterer" came away with the win, earning $13,244 in the process. With 2,303 entrants, the low buy-in for the badugi event more than doubled its guarantee. Who was the biggest beneficiary of that? Kami "drkamikaze1" Chisholm topped the 2,303 player field following a heads-up deal. She earned more than $9,000 for her victory. The first to depart was "arnon shraga." Hiren "hustla16" Patel shoved from early position for eight big blinds and "arnon shraga" called all in from the small blind for five big blinds with . Patel had him crushed with and won the pot when the board ran out . Ami "UhhMee" Barer hit the rail a short while later, committing his last four big blinds with from early position. In the big blind, "joacowalter" looked him up with and held up as the board fell . Chip leader "UpmaxH" started to bully the table a bit and shoved his big stack from under the gun. Charlie "JIZOINT" Combes woke up with in the cutoff and called all in for eight big blinds. "UpmaxH" tabled and came out on top as a board gave the Slovakian two pair to eliminate Combes in seventh place. "UpmaxH" continued to throw his weight around with the big stack and it led to the elimination of Nicolas "niccc" Chouity in sixth. Down to less than three big blinds, Chouity called all in from the big blind with following an "UpmaxH" shove with . Two more nines hit the flop to end Chouity's run. Martin ""0PIGGYBANK"" Finger bid adieu next, losing a flip with to "joacowalter's" when a queen hit the flop. "UpmaxH" relinquished the chip lead in the following level and busted in fourth place as a result. Down to eight big blinds, "UpmaxH" ran into Hiren Patel's and found no help from the board. It was at this point when the three remaining players discussed a deal and ultimately came to an agreement. The chips proceeded to go back and forth for a little while before "Redd Baronn" lost a race with . Hiren Patel did the deed with as the board ran out to counterfeit "Redd Baronn's" pair. Still, Patel was down more 2:1 in chips at the start of heads-up play and it was all over the first hand. With , "joacowalter" shoved on the button and Patel called all in from the big blind for about 10 big blinds with . The board provided a massive sweat as it ran out , giving "joacowalter" trips to earn the victory. Event 5-M ended with a three-way chop in which "Sr amarillo," "Slavik_Krs," and "mrAndreeew" all guaranteed themselves nearly six-figure scores. Others making the first few pages of the leaderboard included Matthias "goodvibe1" Neu (13th - $4,600.57), Tim "Tmay420" West (15th - $4,600.57), Joe "ender555" Ebanks (18th - $3,200.40), Philipp "philbort" Gruissem (20th - $2,720.34), Andrew "RunThisTable" Lichtenberger (43rd - $1,920.24), and Jon "PearlJammer" Turner (69th - $1,520.19). The "low" version of the NLHE turbo event saw a huge field and lots of rebuys and add-ons create a prize pool that more than double the guarantee. It took less than five and a half hours to find a winner, with George Danzer(158th - $250.52), Harley "stoffmakers" Stoffmaker (154th - $250.52), Stefan "I'am_Sound" Huber (92nd - $402.62), Grayson "gray31" Ramage (68th - $536.83), Lauren "locoencabeza" Kling (46th - $648.67), Ignat "0Human0" Liviu (29th - $782.88), and Steve "Mr. Tim Caum" O'Dwyer (20th - $849.98) among those getting relatively deep. We will be providing daily recaps of all SCOOP Day 1s and final tables, so be sure to keep it here at PokerNews to stay up to date on all of the exciting action as it occurs.